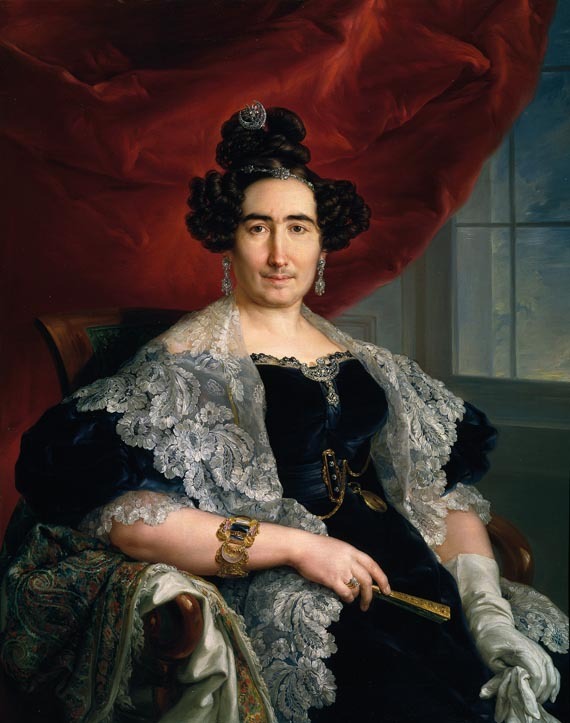 The portrait of Señora Delicado de Imaz by Vicente López y Portaña is arguably one of the most talked about works in the Portrait of Spain exhibition at the QAG. This is most likely due to the sheer visual dichotomy between the lady’s ostentatious finery and the lack of physical beauty (as far as the contemporary appreciation of this issue is concerned). Indeed, Señora Delicado de Imaz wears a splendid fashionable gown of blue velvet, richly decorated with flounces of exquisitely delicate lace; her hair is arranged in an elaborately fashionable style culminating in the Apollo knot; sumptuous jewellery adorns the lady’s head, shoulders, and wrists. The fashionable opulence of this ‘woman of a certain age’ is paradoxically juxtaposed in the portrait to a rather masculine face; bushy eyebrows that almost meet in the middle, and the noticeably downy upper lip and chin. According to the catalogue article, the portrait shows that López y Portaña, then at the height of his fame as an elite portrait specialist, was not a courtly or aristocratic toady, and did not shy away from the realistic portrayal of his august sitters, in keeping with the veristic tradition of his predecessors Velazquez and Goya. I, however, am also tempted to consider this portrait of Señora Delicado de Imaz through the prism of an article by Susan Sidlauskas, “Not-beautiful: a counter-theme in the history of women’s portraiture” [in Shifrin, Susan (ed), Re-framing Representations of Women: Figuring, Fashioning, Portraiting, and Telling in the ‘Picturing’ Women Project, Aldershot: Ashgate Publishing, 2008]. Her essay examines portraits of ‘ladies of a certain age’ by Ingres, and contrasts them against the idealised portraits of his younger female sitters. She argues that portraits like these were created at the time when ‘women of a certain age’ were no longer supposed to be objects of sexual desire; and therefore artists of the era, such as Ingres, López y Portaña, and others intentionally portrayed older women as lacking in physical allure. At first glance, the portrait by Juan Carreño de Miranda (Spain, 1614-85) looks like a Photoshop job gone wrong, for the width of the body is disproportionate to the height of the figure. 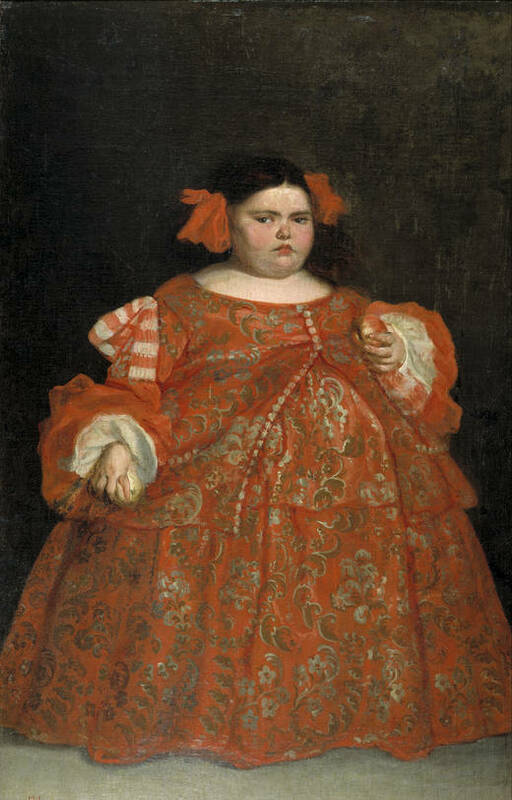 However, it represents a real-life person, Eugenia Martínez Vallejo, an obese six-year-old girl. For all the corseting and cascading folds of the brocaded crimson dress richly embroidered with gold, it cannot disguise the child’s girth as it pulls and stretches to envelop the girl’s body. The portrait reflects a fascination among the Spanish courtly and aristocratic circles in people with physical or mental anomalies. More often than not, they were taken from humble backgrounds, adopted by and given employment at court, dressed at the height of Spanish fashions, and painted by the best artists of the era such as Carreño de Miranda and Diego Velázquez, whose works are also present in the Portrait of Spain exhibition at the QAG. However, as these portraits – as well as the portrait of the Infanta Isabella by Alonso Sánchez Coello discussed previously – show, the presence of these characters as well as exotic animals at court was employed partly as entertainment but also to offset by comparison the visual perfection of the ruling elite, thus maintaining the hierarchical elevation and aristocratic ‘otherness’ of their caste. This penchant was soon adopted throughout the European courts, where society ladies offset their beauty by appearing at court – as well as in their portraits – with pugs or monkeys, and had themselves followed by page boys and servant girls of other races. The portrait of The Infanta Isabella Clara Eugenia and Magdalena Ruiz (c.1585-88), by Alonso Sánchez Coello (Spain, c. 1531-1588), is among the central images of the Portrait of Spain exhibition from the Prado collections, on view at the Queensland Art Gallery until November 4. The portrait shows the Infanta standing full-length and facing the viewer with a fixed and imperious gaze. She is wearing a spectacular dress of crisp white silk richly embroidered with gold; a high starched collar of exquisite lace; and a sumptuous jewelled parure of gold, pearls, and precious stones. 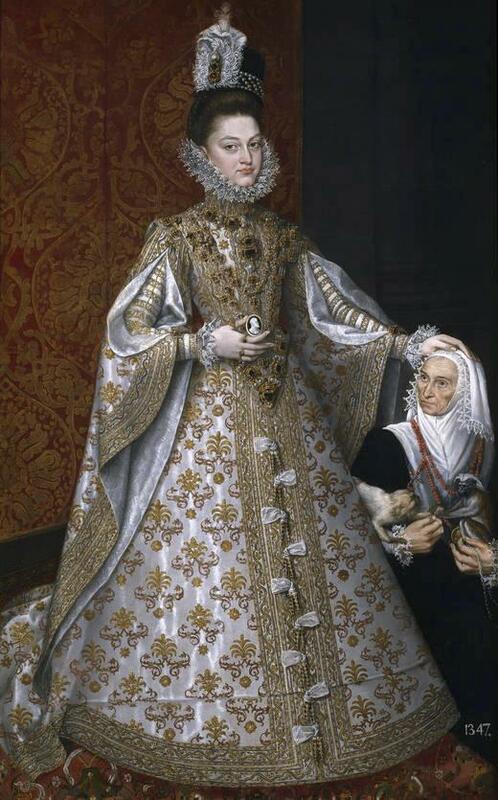 In her hands she is holding a cameo portrait of her father, Philip II, thus paying an emphatic homage to the monarch of Spain. The family servant, Magdalena Ruiz, is kneeling subserviently by the Infanta’s side, vicariously representing the homage of the Spanish nation before its ruling dynasty. She is holding two rare South-American monkeys reflective of the courtly interest in rare and exotic species of flora and fauna as well as a symbol of Spain’s colonial expansion and the (temporary) annexation of Portugal and its South American colonies. The physical and psychological contrast between the Infanta and the servant with monkeys accentuates the message of the ruling dynasty’s elevation to a semi-divine status far above the rest of the humanity.